Xenia Concerts: A New Way to Listen? | MUSICAlive! Home » classical » Xenia Concerts: A New Way to Listen? Posted by Carey Rutherford on Apr 12, 2018 | Comments Off on Xenia Concerts: A New Way to Listen? 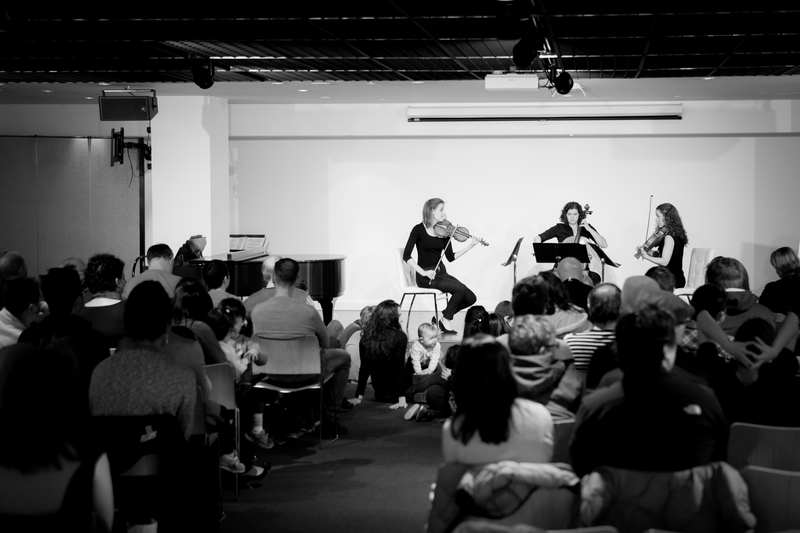 Sarah Nematallah, Violin, Rachel Desoer, Cello, and Caitlin Boyle, Viola perform a Beethoven string trio in a Toronto Xenia concert, 2016. Image courtesy of Xenia Concerts Inc.
“On one of my tours with the ensemble, I came across a very famous pianist named Stephen Prutsman. 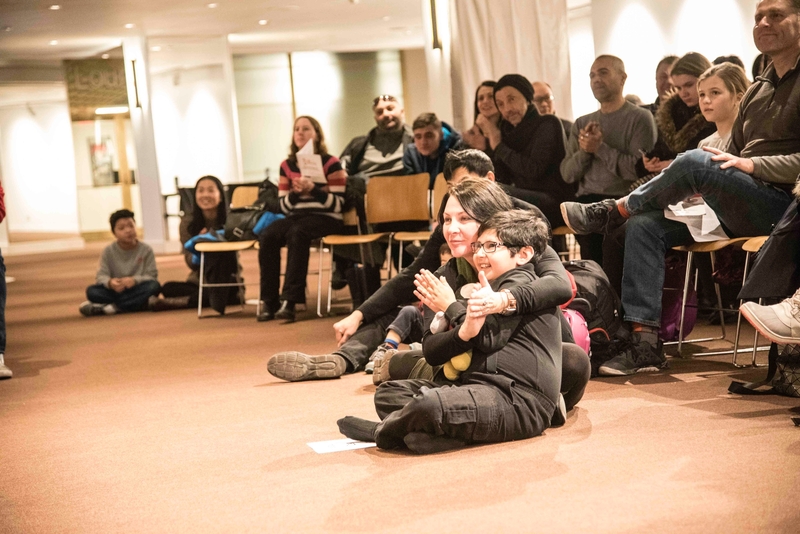 He talked to us on how, for families who are touched by autism, it is often very difficult to get to concerts, because there is typically this unwritten code of needing to sit very still and to listen to the music. You can’t even open a candy wrapper . . . These kids and these families absolutely love classical music, but there is a true accessibility issue here. The performance in Studio Bell is a perfect example of this approach. There are people sitting or standing in the space, according to their choice, and they can walk freely in and out during the performance. Up front, close to the podium, the little ones sit on the floor so that they can move around instead of having to sit still all the time. The main piece of the performance is broken down into parts that are played with an explanation given about each movement. Sarah’s background in teaching shows itself here. “The performance in Studio Bell featured Schubert’s Death and the Maiden Quartet. We broke up the movements: we interspersed it with shorter works by Schubert to present it in a way that makes it more accessible for this audience. So they get to hear Schubert’s Death and The Maiden played by a high level ensemble, but still formatted in a way that make sense for them. A concert like this could happen on a street corner with the train going by, and also the music doesn’t play down to anyone. 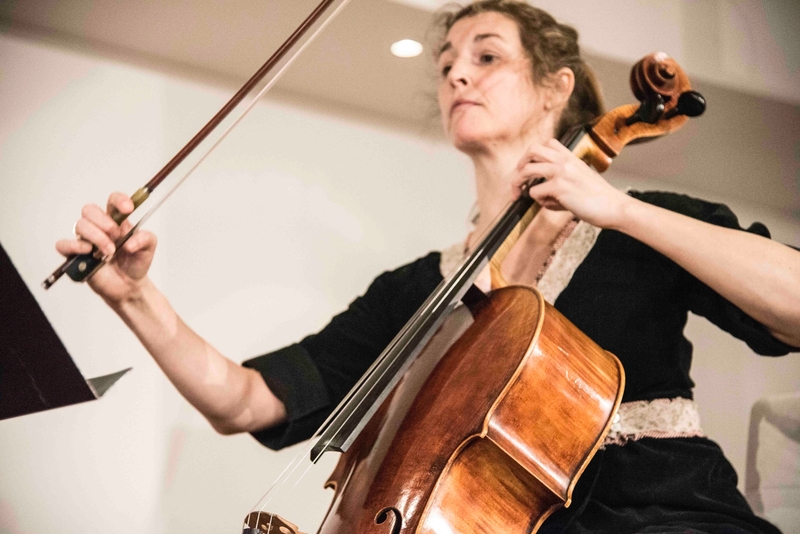 Rachel Desoer on cello demonstrates dynamic arm movements, but the mind is focussed. Photo by Andi Tyler. Apparently there is, and there has been, more to enjoying a classical performance than one would think based on the way it is consumed in most concert halls. And that place is clearly with Xenia Concerts.